« Mocked from Day 1? The need for guidance for associate lecturers (tutors) was identified in 1969 and in 1971 a briefing and training policy was introduced. This focused on briefing of new staff but in 1972 Course Tuition was introduced and in 1973 Teaching by correspondence for the OU. In 1987 a Staff Development policy emphasised the need for continued professional learning. A set of Open Teaching materials was produced to support the policy, including Open Teaching a handbook on teaching and counselling. There was also a manual, The Open Teaching File and a set of ‘toolkits’ about a variety of topics including study skills and support for disabled students. In 1993 Maggie Coats produced an evaluation of the Open Teaching materials and the student-centred Supporting Open Learning materials followed. These were widely used and developed. A fund for personal development was opened in 1987. In 1992 this was revised to encourage continuing professional development and it was revised again in 1997 to incorporate provision for peer mentoring. By comparison induction for full-time academic staff was introduced in 1995 and a programme of staff development for them introduced in 1998.In 1999 there were approximately 7.400 part-time associate lecturers of whom 10% had no other employment and 70% worked in educational institutions and 45 of them within HEIs. In 1997 the Dearing Report recommended accreditation for HE academics and the Institute of Learning and Teaching was established. At the OU a Centre for Higher Education Practice was opened. It ran courses and produced materials. 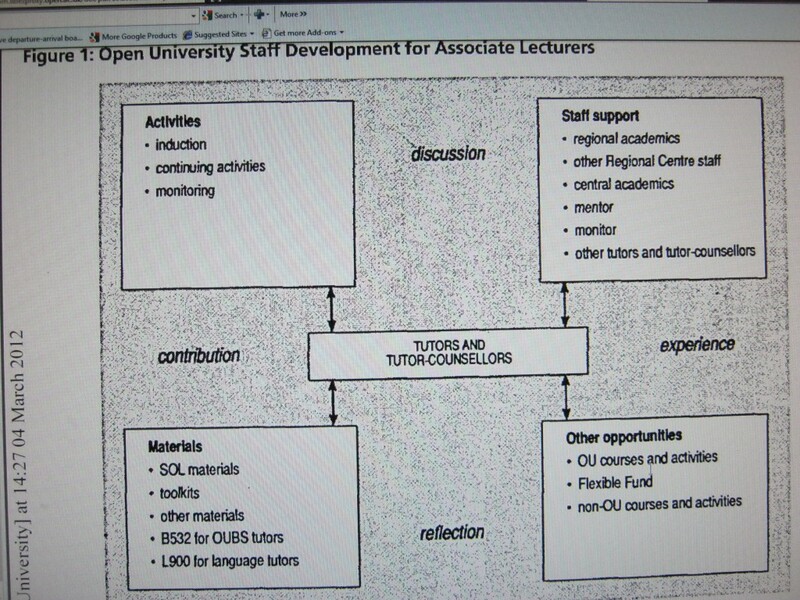 For more on this subject see Anne Langley and Isabel Perkins, ‘Open University staff development materials for tutors of open learning’, Open Learning, 14, 2, June 1999, pp. 44-51. We would also value hearing from ALs and students about supporting open learning. This entry was posted on Tuesday, March 6th, 2012 at 9:00 am by Daniel Weinbren	and is filed under History of the OU, Methods, Online teachng and learning, Students. You can follow any responses to this entry through the RSS 2.0 feed. You can leave a response, or trackback from your own site.